A beautiful sunny morning and with a light SE wind Tony R used a Tektona start with a first leg down to 8, then 6, 5, 9, 3, 4. It might have been a beat to 8, but the wind was constantly changing so for some it was a beat, but for others it could pretty well be anything ! There were 19 starters and first away was Sally in her new Comet, so at least she can say that she led her first race in her new boat. Hugh (Byte) and Hadey (4.7) followed 1 minute later, not strictly true as although Hugh started on time Hadey decided to give it another minute before she crossed the line! Mike A (Lightning) set out next followed a minute later by Chris A and Mike C in their Solos and then Nev and Mike in the Leaders. Next away were the 8 Lasers of David C, Dave I, Dave L, Karen, Curtis, Richard S, Ken P and Phil A with Adrian in the Vago going 3 minutes later and then big Steve P another 9 minutes after that. Paul R started somewhere amongst this, but not exactly sure of the time as he was in a new RS Aero which is not in our current Pursuit Race times. The wind was all over the place and the fleet kept stretching out and then coming together again and individual boats could lose or gain on every leg. At the first checkpoint David C had crept into the lead with Dave I 2nd, Mike C 3rd and Karen a very close 4th, although there was no guarantee in these conditions that anyone could claim their place was safe. After rounding 9 on what would be the last lap the fleet was fairly well stretched out. Then the leading group of boats ran out of wind about 2/3 of the way to No 3. Meanwhile the wind picked up for the boats at the back of the fleet and pretty well the whole fleet approached No 3 with about six boats abreast in rows ! There was much calling for water and windward boat ! Steve P tried a novel approach by rounding on port when everyone else was rounding on starboard! This mass eventually got sorted and set out for No 4 and then on the final run/reach/beat to No 8 (it depended upon where you were at the time) the finish gun went. The final positions were 1st Paul R (Aero), 2nd Dave L, 3rd Dave I (Lasers). Here is a link to the Bart’s Bash results. Not the normal format. The times are factored up for those that did not do the same number of laps as the leaders to what they would be for 6 laps. We had a brilliant turn out for Bart’s Bash today. We had 39 boats sign up and enter for this race which has been officially adjudicated for the purposes of being entered to participate in the Guinness World Book of Records ! Well done every one who took part and a huge thank you to Newton and his team of helpers on Race Officer Duty and Safety boat rescue. There was a good breeze ! Official results to follow ! We raised £210 just at the club alone with donations to enter the race and cakes – (this excludes the final figures for all the just giving donations) Final fundraising figures to follow too ! The format for this Sunday’s racing has been changed from a short race for Bart’s Bash followed the normal Cobley series race. 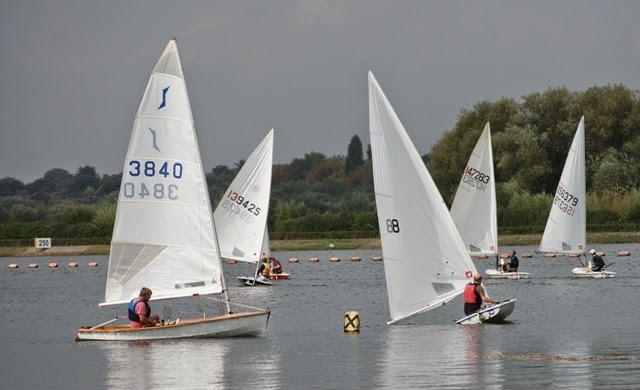 The Cobley series race has now been CANCELLED to make way for a longer Bart’s Bash race. The Bart’s Bash race will now be a handicap race of just over a hour for the lead boats. It will be shorter for slower less experienced racers. There will be a briefing at 10.10 and the race will start at 10.30. For those who have not aware this is a charity race please find details online at www.bartsbash.co.uk You need to register for this race. This can be done online up to the 19th. They made a ‘raft’, did a lot of capsizing and had a lot of fun as ever!! The stunning sunset was a perfect back drop for the boats – see Face Book for pictures. Everyone enjoyed hot chocolate amid the thanks and cheers for Gary and Monica – bottles of wine were gratefully received and vouchers for Haweli. A great end to another fantastic season of Pirates. Pirates Halloween / Fireworks celebrations is likely to be Nov 8th….watch this space for more details. Pink Fleet Sat 13th Sept. The day dawned grey but that did not deter 20 boats from rigging and taking to the water. After a hearty breakfast and a briefing in the clubhouse, a motley selection of boats with youngsters and oldies, sailed down the lake for a Tektona start. Amy and Tracey, closely followed by Richard and Alice were right on the line at the start. Alice, despite doing some penalties or not…? ?one the race by mile, but was disqualified of course!! It was good to see Lily in an Oppie, Alistair and Laura in their Laser, Sally going well in Newton’s Laser and lots of youngsters in Toppers, including William and Patrick having so much fun in the water, instead of on it!! There was a bit of crowding, bumping and shouting at 8…..but a very high standard of sailing overall. The Pink Fleet cup went to Steve for sailing his First ever race….well done Steve, who had to settle with a kiss from Monica in lieu of the cup which had not been returned…. I wonder who that was…??? Thanks were given to James, Pat, Brian and Monica for manning the safety boats. NEXT PINK DAY IS 11 OCTOBER. Nice to see Mark back on the water, but let’s hope we see him next in his Laser rather than in the Safety Boat. There was quite a good wind, 10-11 mph but it was in a slightly tricky ENE direction and Mark opted for a Tektona start coming down to X, then back up to 5, 1, 4 and 3. There were 16 boats under starter’s orders and first away was young William P in his Topper followed 9 min later by Hadey in the 4.7, then 3 min after Hadey, Mike C (Solo) and Bob & Roland (Leader) set forth. Then 2 min later it was the turn of Newton & Ellen (Laser 2000) and Issy (Radial). Great to see Issy back on the water, another prodigal returning to us. Peter R & Colin H (Enterprise) started soon after followed by the Laser pack, with Paul H (Supernova) 1 min later. Adrian had to wait another minute before he could get away in his Vago and marking time for another 10 min were Steve & Lynn in the 505. Another welcome back, this time to Lynn who has had to stay away through an injury. It seemed to be a day for returning sailors ! After one lap Newton & Ellen had passed the boats ahead of them and came through in 1st place, Hadey was still hanging onto 2nd, but the Laser of David C was already ominously close in 3rd with Peter & Colin 4th, then the Lasers of Karen, Dave P, Curtis and James P closing in on the Enterprise. Obviously a good day to be in a Laser ! Mike C came through in 9th chased by Issy, Adrian and Paul H. Adrian was flying his kite when he could, but the runs were not long enough to make a significant difference, still it looked great. Next came the last starter, the 505, which had passed Bob & Roland, Mike T (Laser) and William P.
Newton & Ellen still led at two laps, but David C had moved to 2nd with Peter &Colin 3rd and the Lasers of Karen, Curtis, James P and Dave P in the next four places. The highest mover on this lap was Paul H who had gained three places. At the end of the third lap David C and Karen had passed Newton &Ellen to take 1st and 2nd places respectively. James P had passed Curtis to move up to 5th and the other movers (upwards!) were Mike C and Paul H who each gained one place and Steve & Lynn who had gained two places. On the final lap Curtis broke his tiller extension and had to retire before the finish gun. At the gun the first three were the same, but the main mover was Dave P who had passed Peter & Colin and James P to take 4th place. Well done to William who persevered in his Topper to the end. With a light North wind, which was veering considerably, Jon M set a first leg down to 5, across to 9 then down to 3 and back up the lake. Another good turn out with 23 boats led off by William P in his Topper followed by John C in the Topaz and then Hugh in a Byte. At the end of the first lap John C had passed William but he was still in 2nd place. Monica had passed Hugh to take 3rd, Mike A (Lightning) and Chris A (Solo) were next but the Laser pack was making ground with Karen moving up to 7th, closely followed by David C, Curtis, Dave L and Andy Burr. The next boat along was the RS Feva of the Page family, the first Feva to sail in any series so far this year. They were followed by the three Lasers of James P, Dave I and John W, who were being chased by Adrian in his Vago who had caught and passed Phil A in another Laser. Then there were the three Radials, Sylvia, Jess and Paul who were being caught by the last boat to start, the 505 of Steve P, who had already passed Eddie and Chris M in Lasers who had started out 11 minutes ahead of Steve. Monica led at the end of the second lap and was being chased by David C who had managed to break clear of the other Lasers. Mike A was now 3rd, but the Lasers of Dave L, Karen and Curtis were breathing down his neck. Hugh had slipped down to 7th with John C 8th and Chris A 9th. Steve P was flying and had moved up from 20th place to 12th place. At the finish gun David C was in the lead with Steve P 2nd and Dave I who was in the right place at the right time snatched 3rd from the rest of the Lasers. This was the final race of the Gillette Series and Ian C had already got the series in the bag. There was a light East wind which forced Mike A to set a Tektona start line coming down towards the clubhouse to X on the first beat. 25 boats started including the Toppers of Edward, Joe and Grace, our future champions ! Ian came through in 1st place followed by Newton (Laser), Steve P (505) and Curtis (Laser). David C and Karen both in Lasers came next in very close company, then there was a slight gap to the Lasers of Dave I and Dave L. The next three boats were double handers led by Nev & Mike (Leader) then Angela & Paula (Comet Duo) followed by Sally & Stuart in another Leader with Bob L, who is often in his Leader but on this occasion was in a Laser chased by another Leader crewed by Tracey & Carol. (talk about follow my leader !). There was another gap until Mike T (Laser) crossed the line, closely followed by Paul H (Supernova), Sylvia (Radial), Hugh & Hadey (Sport 14) and Alistair J (Laser). Quite a bit further back came Dean (Laser) and Monica in her Europe, who is usually much further up the fleet until the last lap when she often retires to give everyone else a chance ! Towards the back Jess (Radial) was battling with Nick J (Laser), followed by the three intrepid Toppers. By the end of the second lap Steve P had forged to the front pushing Ian down to 2nd and Newton to 3rd. Karen had squeezed past David C and Dave L had got past Dave I. The boats in the middle of the fleet were holding station, but Mike T had moved up two places from 14th to 12th and Hugh and Hadey had got past Sylvia. Only one more lap as the wind was dropping fast and the first three across the line were the same as the previous lap. Karen had moved up one more place pushing Curtis down to 5th. David C deliberately sailed round the outer pin to retire, moving Daves L and I, Nev & Mike and Angela & Paula up a place. The final positions on the water were 1st Steve P, 2nd Ian C, 3rd Newton, however it is likely that Steve in his galleon will be pushed down the order on handicap with Ian taking the final race and the series. Remember, it’s not just back to school this week, but Saturday sees all the fun of the fair with a club work party! Please turn up and do your duty to help out at the club, there will be plenty of jobs both inside and out. For those of you who are enthusiastic DIYers then please bring some tools with you e.g. hammers, screwdrivers, sockets to help with the jobs (a list can be found below). The Jolly sailor looks forwards to welcoming you all along and will ensure that the kettle is on with tea and coffee flowing. For those using strimmers, mowers etc the club advises that long clothing and strong boots are worn, visors & ear protection are available.